With the concurrence of County Parks, Supervisor Das Williams's office has sent out a request for public help cleaning up homeless camp debris from Summerland Beach. Heal the Ocean believes it could be hazardous. Anyone who’s taken the southbound train has seen the dozens of tents set up along the railroad properties, temporary or permanent camps for homeless people, some of whom are employed nearby. In Summerland, community complaints reached a siren’s pitch when a fire broke out at one of the camps. 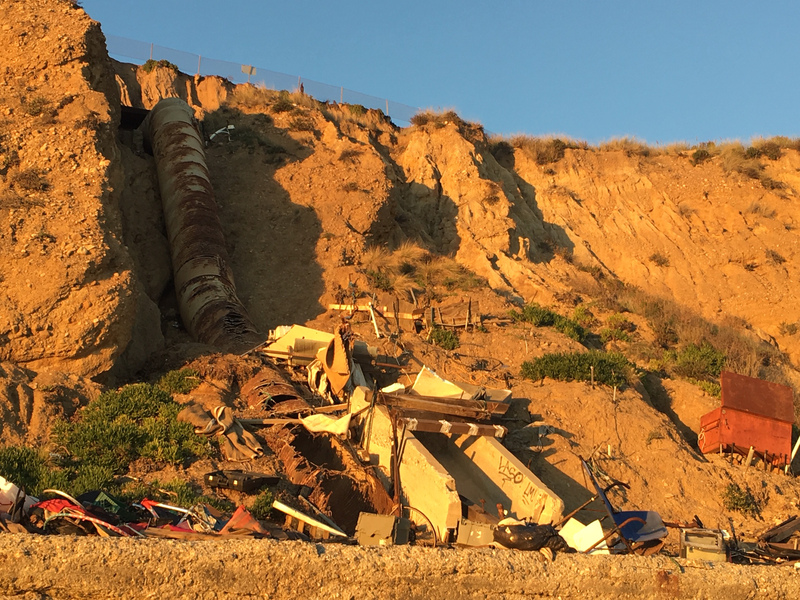 Then, this winter’s rains apparently sent a camp on the cliff sliding to the beach, and Supervisor Das Williams’s office sent an email on Tuesday asking for the public’s help cleaning up the debris. Whether that’s a safe idea and what’s happened to the homeless people are questions Heal the Ocean’s Hillary Hauser has been asking. Heal the Ocean became involved in the Summerland issue, donating $15,000 to the effort to relocate the people living on the cliff side, said Hauser, believing in a “humanitarian solution.” Distraught residents were calling, Hauser said, and a drone shot of the encampment in 2017 was convincing of a public nuisance and danger. With Heal the Ocean’s seed money, staffers with the homeless aid group called Home for Good and AmeriCorps members began in August to survey the cliff dwellers, collecting information to get their paperwork organized for housing assistance. They found about seven people living in the camps, some intermittently as they traveled between Santa Barbara and Ventura, and another three to five living in vehicles. Travis Baxter, an outreach worker, noted that the camps included touches like closets for hanging clothes and lighting. Another worker wrote that one person said they’d lived in the area for 30 years. Their visits continued over the months, and they made incremental progress in earning trust, completing paperwork for three individuals, referring another to Public Health, and working with two veterans. Home for Good’s “Summerland Partnership Report” states that weather conditions began to make it dangerous to scale the cliff in November. At some point, the camp was apparently abandoned. A spokesperson for property owner Union Pacific stated it had not removed the camp; Lt. Butch Arnoldi with the Carpinteria/Summerland Sheriff’s Substation stated his team hadn’t moved people out. What’s curious is how the debris reached the beach, as Williams described; the camp lay below the 101 and above the railroad tracks. Reeve Woolpert, an artist and photographer who lives in Summerland, knows most of the cliff dwellers. He told the Independent the stuff on the beach had been brought there by one homeless man, whom he described as a packrat. More than one fire has broken out at the messy camp, Woolpert said. He’d seen a Union Pacific contractor clearing campsites and sheriff’s officers on site after the fires, but not for several months. The handful of people living on Summerland’s cliffs are, for the most part, pleasant and very nice, Woolpert had found. They considered themselves residents of Summerland, had camped there for years, and had their own support network. As for the greater community, some loved the campers and others feared them, Woolpert thought, but the cliff dwellers all had interesting back stories though they now live on the margins of society. He didn’t believe it was likely any of the residents would move from their homes on the cliffs. He also believed Heal the Ocean was making life more difficult unnecessarily. Home for Good’s Emily Allen, who has worked for many years to re-house homeless people, acknowledged that fewer than 10 people in Lompoc had been moved into permanent supportive housing, meaning subsidized housing with mental health services. It generally takes longer than the 30 days the triage center existed to process the documentation required, and she was surprised they were able to house that many people. Travis Baxter had reported more than one camp in Summerland, Allen said, thinking it was likely the people had simply moved elsewhere from the camp that slid down the cliff. The County Parks department oversaw Summerland Beach, said Williams’s aide Darcel Elliott, and they thought a community cleanup was a good idea. The folks from Summerland she’d spoken with had agreed. The public project to clean up the remaining camp materials gets organized at Lookout Park at 1:30 p.m. on Thursday, April 4, then heads to the beach until about 5:30 p.m.
Carpinteria Health Care Center/Carp Connect , 931 Walnut Avenue, Carpinteria; Wednesday, 1 p.m. â€“ 4 p.m. PATH Santa Barbara, 816 Cacique Street, Santa Barbara; Monday, Tuesday, Wednesday, and Thursday, 8:30 – 10:30 a.m. The Salvation Army, Hospitality House, 423 Chapala Street, Santa Barbara; Wednesday, 1 â€“ 2 p.m.
Veteransâ€™ Memorial Building, 112 West Cabrillo Boulevard, Santa Barbara; Wednesday, 9 â€“ 10 a.m.
For more information, go to HomeForGoodSBC.org or call (805) 450-3558.